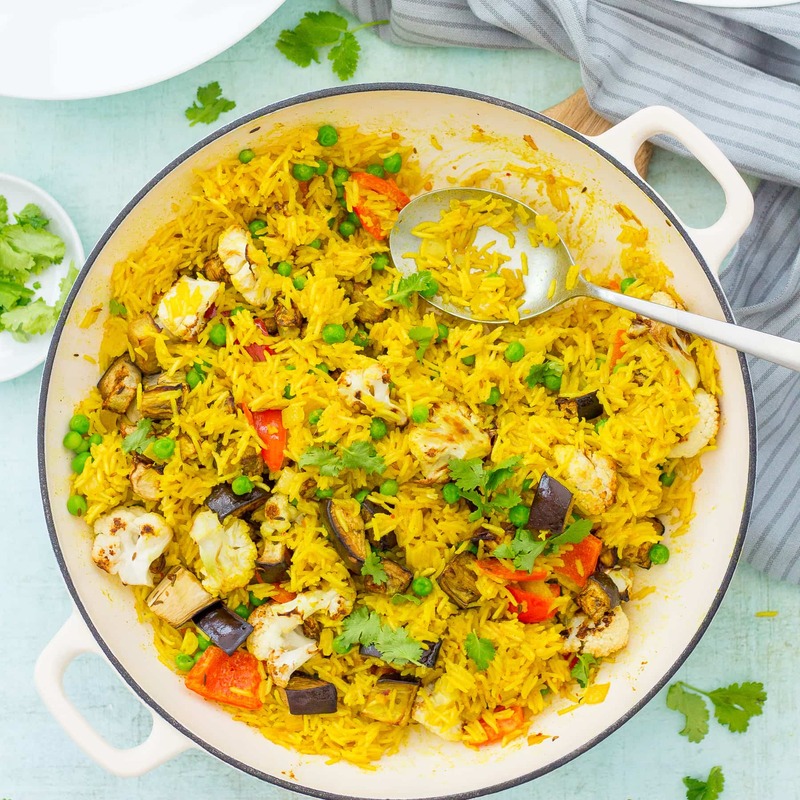 Packed full of flavour and healthy vegetables this Easy Vegetable Biryani is quick, simple and delicious – the perfect midweek meal! It’s also vegetarian, vegan, gluten free and dairy free. Healthy but definitely not boring! Who says healthy meals have to be boring? Certainly not me! And this Easy Vegetable Biryani is anything but boring. It’s packed full of garlic, chilli and spices – plus a whopping great 6 different vegetables (perfect if you are trying to get your ‘5 a day’). 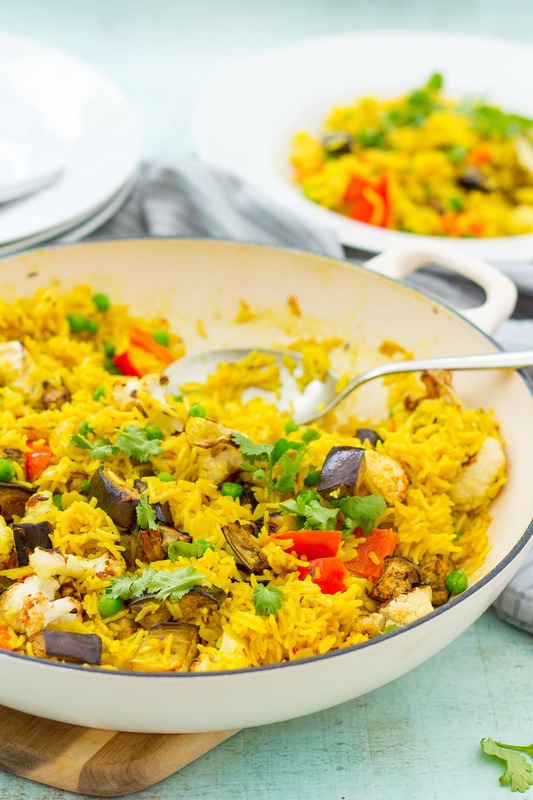 In fact this vegetable biryani is full of nutritious deliciousness and yet comes in at just under 500 calories per (generous) portion. 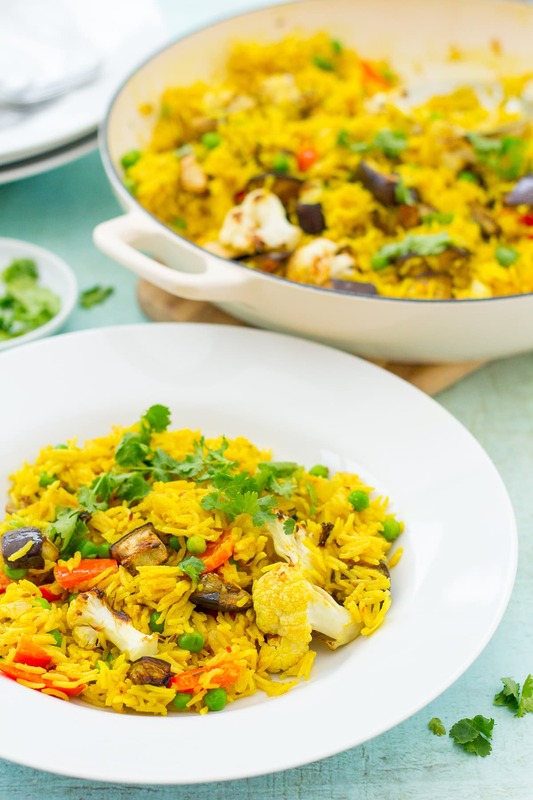 This Easy Vegetable Biryani is vegetarian, vegan, gluten free and dairy free – making it a great choice if you are cooking for a variety of dietary requirements. It’s also great if you are cooking for a mix of meat eaters and vegetarians/vegans. For those who feel they need meat, you can add in some cooked chicken (or indeed any cooked meat) with the peas, 5 minutes before the end of the cooking time (just make sure the meat is piping hot all the way through before serving). Alternatively, you could serve this vegetable biryani as a side dish to a grilled/pan-fried chicken breast or salmon fillet. I make no claim that this vegetable biryani is authentic or traditional in any way. An authentic vegetable biryani would take MUCH LONGER and involve MUCH MORE EFFORT. Instead my Easy Vegetable Biryani captures the spirit of a traditional biryani – but is much less time-consuming and far less effort. Perfect for busy weeknights! 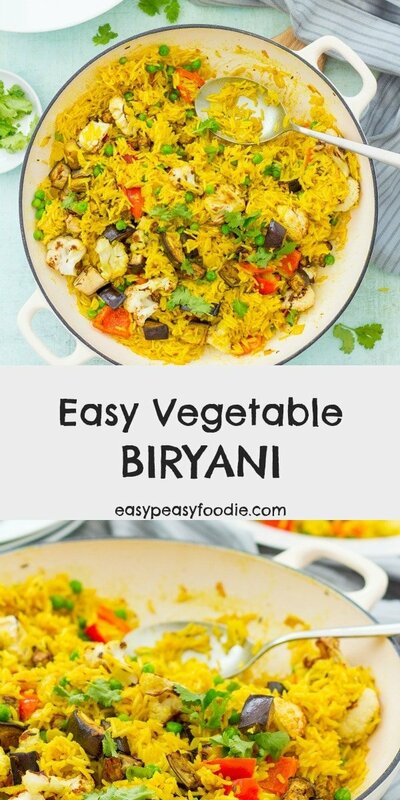 What to serve with vegetable biryani? 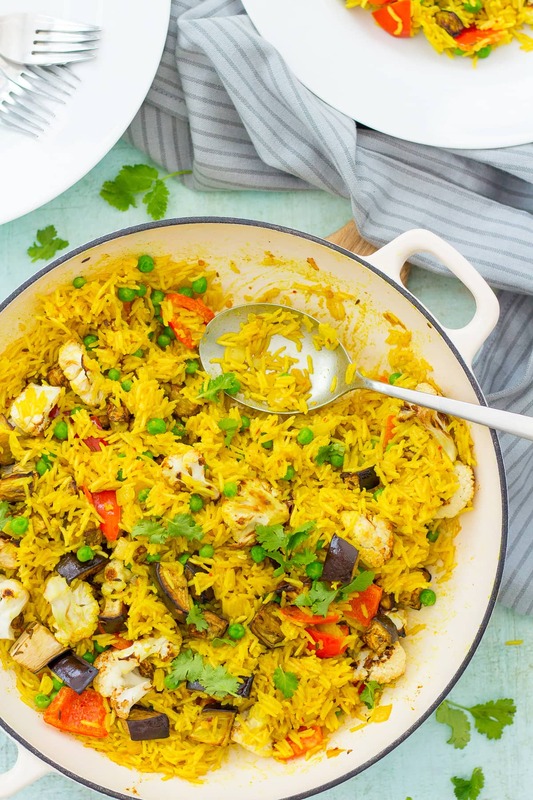 This easy vegetable biryani is a delicious meal in its own right – served on its own as a quick and easy midweek meal. For a little extra pizazz, serve with all your favourite extras, such as naan breads, pickles and chutneys. Alternatively, you can serve it as a side dish – as an accompaniment to one of my other curries. What to drink with vegetable biryani? As with all my curries, the best match here would probably be beer – an IPA, or similar, would be perfect. 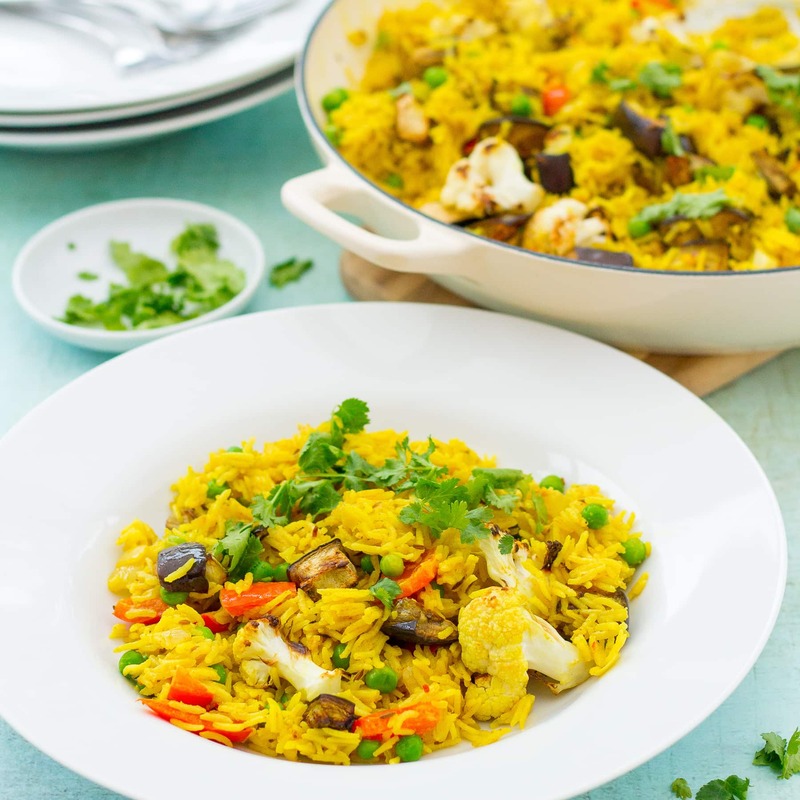 If you are like me and prefer to drink wine, then an aromatic white works well here: an off dry Riesling, a Pinot Gris (Pinot Grigio) or a Gewürztraminer are all good matches for this vegetable biryani. A fruity rosé would also work well. If it simply has to be red, then try something fruity and medium bodied – a Chilean Merlot, for example. 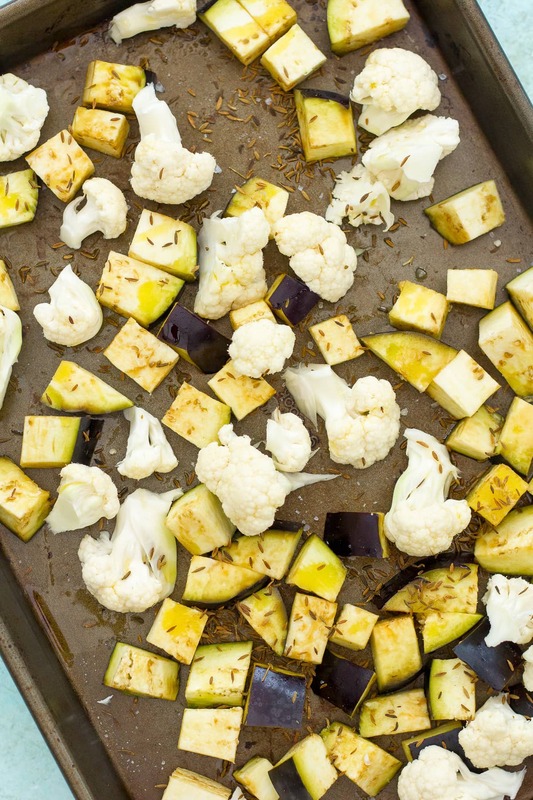 Place all the ingredients for the Cumin Roasted Aubergine and Cauliflower in a large oven tray and toss together. When the oven has heated up, roast the vegetables for 20 minutes or until soft. Meanwhile, put the remaining tablespoon of olive oil, the sliced onion and pepper in a large frying pan or sauté pan (must have a lid). Fry gently, with the lid on, for 5 minutes or until softened but not browned. Stir occasionally. Remove the lid, add the garlic, chilli and spices and fry for 2 minutes, stirring occasionally. Add the rice and stir to coat the rice in the onions, garlic and spices, then add the coconut milk and water and bring to the boil. Put the lid on the frying pan and turn the heat right down, simmer for 7 minutes. Add the peas to the pan, stir and replace the lid. Cook for a further 5 minutes or until the rice is done to your liking. If it starts sticking before the rice is cooked, add an extra splash of water. Finally stir in the roasted aubergine and cauliflower and 2 tablespoons of chopped fresh coriander. Sprinkle extra coriander on top and serve with all your favourite extras, such as naan breads, pickles and chutneys. Suitable for freezing. Defrost before reheating. Reheat until piping hot in the microwave or oven. To reheat in the oven: cook in an ovenproof dish, covered with foil at 180C / 160C fan/ gas mark 4 / 350F, for 20 minutes or until piping hot all the way through. I love the way you roast the veg here. I reckon it would make all the difference to the finished dish. I’ll have some mango chutney and a beer with mine please! This looks really tasty I’ll have to give it a try! Well, Veganuary will never be boring with your great selection of recipes! I’ve never made biryani before—mostly because, as you say, the authentic version is too labor intensive. But YOUR easy version is rocketing straight to the top of my to-make list. I adore dishes like this that are loaded to the gills with veggies! YUM! what a beautiful dish, The peas would love this! Curries and Indian food in general is very very popular in this house! Eb, the colours of this are stunning, it looks too good to eat! It sounds fabulous though so I’m going to definitely give this one a go soon!